Sunjunkie are the leading manufacturer of professional spray tan machines and even produce machines for a number of UK spray tan companies. Sunjunkie tanning machines are used all around the world in many high end salons and have even been used at some of the worlds most prestigious events such as the Paris and New York Fashion Weeks. Sunjunkie offer a wide variety of spray tanning kits that include everything you need to get started such as solutions, pop-up tanning tents, marketing material and accessories. Our spray tan machines are one of the only models that can produce an unlimited amount of spray tans daily without damaging the machine or overheating. Our precision HVLP guns are finely tuned and tested by our experts to produce the finest spray mist available, increasing the level of accuracy when used on clients to give flawless results. Our spray tanning machines are suitable for seasoned professionals and first time beginners and are available in a number of different kit packages to suit all businesses and budgets. For beginners our kit packages come with a free fully accredited and industry certified spray tan training course held on a 1-2-1 basis at our Manchester Training Academy. For professional and mobile therapists our bespoke tan machines and kit packages are designed to help your business/salon with providing the best possible service to your clients. Whether you are providing a first class service in your own salon or from the comfort of yours or your clients home, Sunjunkie spray tan machines and kit packages can help increase your client retention with flawless results every time. Our spray tanning kit packages come with everything you need to start your own spray tanning business and are suitable for both salon and mobile spray tanners. Discover our best selling Sunjunkie Black Edition Tanning Machine which was used at the New York Fashion Week and the UK X factor, our best selling model because of the high performance and consistent results it produces. Available as a single spray tan machine or as a full kit package which includes spray tan solutions, pop up tanning tent, marketing material and accessories. All Sunjunkie machines come complete with an instruction manual and online training tutorial to show you the famous Sunjunkie Technique. We will even dedicate one of our experts to you who will be on hand 5 days a week to provide you with any advice, tips and guidance to help you provide the best possible service to you clients. Prices on kits and packages range from £179 - £499 based on which machine and kit contents are required. We offer a full 12 month warranty on all equipment, in the likely even that a fault occurs, Sunjunkie have a full team of engineers and designers on hand to fix and repaid any faults, blockages or damages. Sunjunkie produce and manufacture spray tanning machines that are sold all around the world. 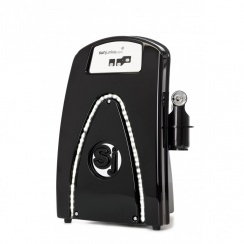 Our black hvlp spray tan machine is our best spray tan machine given its popularity with many of the UK's leading spa's, salons and mobile spray tan therapists. The machine itself is one of the only spray tan machines that can produce an unlimited amount of spray tans daily. With many other spray tan kits, performing a high number of spray tans on a daily basis can lead to problems such as overheating, motor cutting out and even breaking the machine all together due to overworking it. However the Sunjunkie black HVLP spray tan machine is the UK's best spray tan machine due to its high performance, ease of use, accuracy when spray tanning, look and design. Sunjunkie allow you to mix and match when it comes to choosing your desired spray tan kit package. For example, many mobile spray tan therapists will require a pop up tent so that they can spray their clients in the comfort of their own home, whereas professional Spa's and Salons will require Sunjunkie marketing posters so they can promote Sunjunkie spray tans in their business. Whatever you require in your spray tan kit package Sunjunkie will always give you complete control and will allow you to build your package to suit your business and budget.